Made the British public hate the Germans. Made France think that Germany wanted to destroy its empire. Showed that the British thought Germany wanted to challenge the British navy. Made Austria-Hungary determined to destroy Serbia. Made Russia determined to support the Serbs. Made Austria-Hungary frightened of Serbia. Made Britain think Germany wanted to destroy its empire. Made Germany determined to stand up to France and Britain. Seems like the line is blurring between the "liars" and the "thugs" from yesterday's post, while the "cowards" might actually be owed an apology. 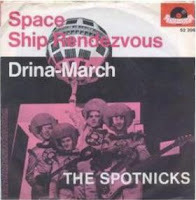 “We sincerely regret that people were offended by this song,” the agency’s spokesman, Martin Nesirky, told reporters. There are three quotes in the article written by Neil MacFarquhar. This is one of them, another is a mangled mis-translation of the lyrics, and the third is an excerpt from the statement by Vuk Jeremic, Serbia's ex-FM now chairing the General Assembly, which makes it sound as if he's proud of the alleged atrocities allegedly accompanied by the song. MacFarquhar also calls the Battle of Cer "infamous". Okay, English is not my first language, so let me see if I understood that right. The Merriam-Webster dictionary defines the meaning of "infamous" as "having a reputation of the worst kind, notoriously evil". What?! The first Entente victory in the Great War, a triumph of the outnumbered, outgunned defenders turning back a cruel invader bent on eradicating them - that's "notoriously evil" and "having a reputation of the worst kind"? Who's editing the New York Times, Count Aerenthal? Now, disregard for a second all the "editorial guidance" in the story, and focus on what the UN spokesman, Nesirky, actually said. "We sincerely regret that people were offended by this song." Not "The people who complained are absolutely right, this is a horrible atrocity," but a "Sorry you feel that way". It's not apology as much as an expression of sympathy. A diplomatic equivalent of a shrug. This is a screenshot of a Google search, using the phrase "UN Serbia apology", this evening around 7 PM. Look at all the terms appended to the perfectly neutral statement. "Militant". 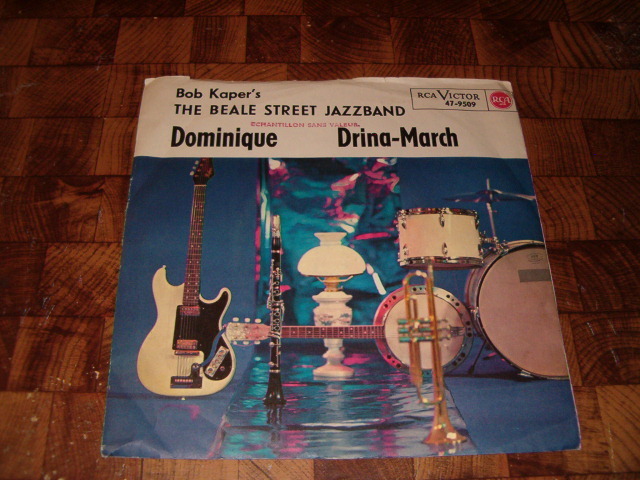 Well, it is a military march, but you never see the adjective used to describe Sousa's "Stars and Stripes Forever," do you? And I'm sure the Vienna Philharmonic is routinely condemned as "militant" for playing the Radetzky March every New Year... What? It isn't? "Nationalist"? What does that even mean? The embellishments then go to the next level: "associated with massacres", "genocidal" (?!) "linked to the Srebrenica massacre" (?!) etc. Come again? Says who, the "Bosniak Congress"? Is that where these "reporters" got their "facts"? A couple of lazy journalists copy the loudmouths' handout, everyone else copies their notes - embellishing as they go along - and this is supposed to be journalism? Makes sense, I guess. Serbophobia is the only officially approved form of bigotry these days, after all. I suppose an apology of my own is in order. I regret characterizing Nesirsky as a "spokesthing" and his organization as "spineless", having accepted at face value the mainstream media's misrepresentation of his statement. And as someone who has criticized the media for over a decade, I should have known better. But if that can happen to me, imagine how people not disposed to mistrust the mainstream media will read the propaganda I've parsed above. Now that is truly infamous. In the dictionary sense of the word. I've mentioned before that the Serbian Orthodox Church follows the Julian calendar, which is currently about two weeks off from the Gregorian commonly used in the West and elsewhere. So the Gregorian January 14 was the Julian January 1, and hence New Year's Day. This was the occasion for the current UN General Assembly chairman, formerly Serbia's Minister of Foreign Affairs, to organize a little concert and reception on East River. It revolved around the performance of an a capella choir "Viva Vox" (notice the "chauvinistic" Latin name). A recording of the show is available on YouTube. 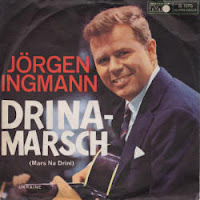 And one of the songs the choir performed - and received by the audience with quite a bit of enthusiasm - was the "Drina March." 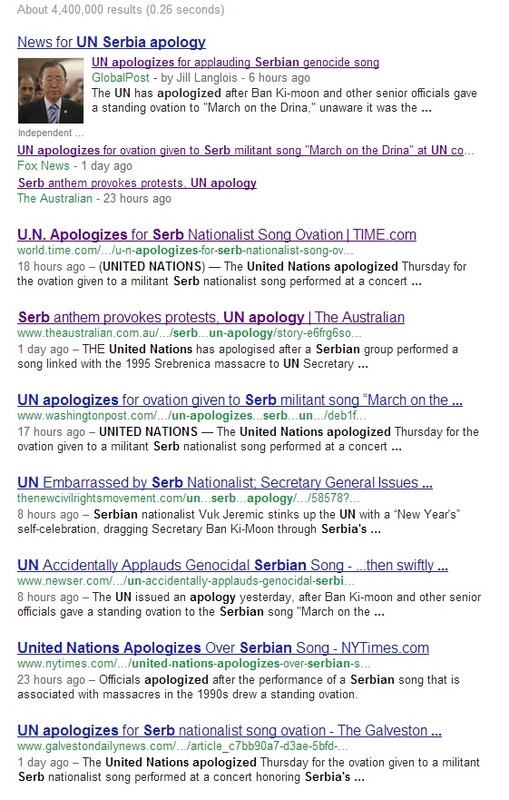 Within a day, the UN was being harassed by haters: the "Congress of North American Bosniaks" and its satellites (I've written about their activities before) sent a nasty letter to the Secretary-General, claiming the song was a symbol of "aggressors" and insulting to "victims of genocide." The GenSec's spokesthing (can't even call it a "person" anymore, might offend someone) instinctively apologized, of course. Such behavior is par for the course for the spineless bureaucracy on East River, used nowadays primarily as a forum for politically correct hatred of the West or a fig leaf for Imperial intervention, depending on what day of the week it is. - the song was "originally written as a nationalist hymn after World War I". Wrong! Stanislav Binički composed it following the Battle of Cer, in August 1914, after the outnumbered and outgunned Serbs fought off an invasion from Austria-Hungary. - it "became a favorite of fascists and Serb nationalists". Says who? First of all, this facetiously pretends that "fascist" and "Serb nationalist" are the same, and they are not. Were "fascists" decorated by the U.S.? Were they the people who saved U.S. airmen that bombed them? Or those who opposed the Communist takeover of Yugoslavia and the amnesty of Croatian Nazis (some of them later known as "Bosniaks") that followed? I know that "Serb nationalists" are somehow supposed to be evil incarnate, but can anyone actually coherently explain why - without relying on thoroughly debunked propaganda by their enemies, who just so happen to have been Nazi allies back in the day? - it was "banned by Yugoslavia's Communist government after World War II". Wrong again. In fact, the Communists produced a movie about the Battle of Cer in 1964 (on its 50th anniversary), praising the Serb military prowess, featuring the song prominently throughout, and even sharing its title. There was even a bit about how it was voted the new Serbian national anthem in 1992, but the government decided against it - supposedly because it would have been inappropriate due to the Bosnian War. But CNAB and the Empire and AP accuse that particular government of being the "aggressor" in the said war, so its supposed sensitivity in this instance makes zero sense whatsoever. Or rather, as much sense as the mainstream narrative. 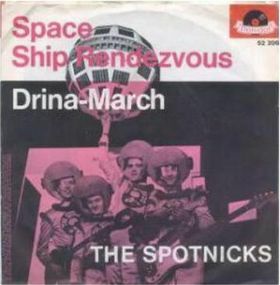 So what is one supposed to make of the multiple covers of the catchy trumpet tune, from a 1960s acoustic version by "The Spotnicks" (heard here in a Greek film), to a modern electric guitar cover? Never mind any of that, you're supposed to hate the song, and feel ashamed for liking it and demanding an encore - because professional victims of the CNAB claim it was a "favorite of [imaginary] fascists and [supposedly evil] Serb nationalists." And the AP says so as well, so it must be true, right? Add that to the constant stream of apologies you're supposed to make, to anyone who demands them, for anything they can think of. Anything else would be "racist" or "insensitive," the two only sins of modernity in which all the other sins and vices have been declared virtuous, hypocrisy most of all. As the anniversary of the Great War draws near, expect the mainstream media and academia in the West to blame the Serbs for it. A few already have, here and there, but I would not be surprised if it becomes a concerted effort in the coming days. The first shot may have already been fired: a reader let me know this morning that a new book is out by Cambridge historian Christopher Clark, that does just that. I wasn't surprised in the least to see that Clark is an acclaimed historian of Prussia, and therefore minimizes Germany's role in starting the war, shifting it to the Serbs and Russians instead. I've addressed before this persistent tendency to blame the suicide of the West on the Other - i.e. the Orthodox Russians and Serbs, who were just rude and inconsiderate enough not to roll over and die when invaded by their Teutonic "betters." The Endless Summer of 1914: my first response to the "blame the Serbs and Russians" crowd (2010). The Enduring Schism: examining the Western hostility towards the Orthodox (2012). Echoes of 1878 (2012) doesn't deal with the Great War per se, but examines the behavior of Western powers in the four decades prior, and the Balkans Wars. 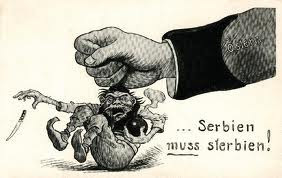 Then, as now, the Serbs were a "disruptive factor" to the Mitteleuropäische Ordnung dreamed of by the Western powers - the Hapsburgs, Hohenzollerns and Saxe-Coburg-Gothas (a.k.a. the Windsors) then, the Atlantic Empire and the Brussels Union now. Not because they were "lawless", or had dreams of conquest, but because they insisted on being free. It was the Serbs who started to complicate the Eastern Question for the West, by launching a successful uprising against the Turks in 1804. It was the Serbs who resisted enormous pressure from Vienna to embrace Catholicism and drown in the Hapsburg melting pot. The only people in the Balkans without German kings or princes. That just could not be tolerated. Then, or now. Technology may have changed since, but that basic fact has not. Make of that what you will. "By their fruits you will know them," it is written in the Gospel of Matthew (7:16). It is simple, straightforward advice: watch what they do, not what they say, or what is said about them. If only such a standard could be applied to "Kosovars," Albanians who occupy the Serbian province of Kosovo and claim it as an independent state (with a little help of NATO and the Empire, of course). Their "liberation army" began by murdering their own people - "loyalists" who wanted to live together with the Serb majority. Then they started murdering children, postal workers, and police. When the authorities responded by hunting them down as the terrorists they were, a hue and cry arose in the Western media: war crimes! Humanitarian crisis! Genocide! Something had to be done! But the drones, missiles, bombers and laptop bombardiers, even lawfare, all failed. It was treachery that won the day for the Empire in the end. Having seized the province, Imperial troops proceeded to shred the deal that let them in, letting the Albanians run rampant. More than 200,000 non-Albanians (mainly Serbs, but also Jews, Turks, and many other communities that once lived in the province) were driven out, while NATO troops stood by, and NATO media called it "revenge attacks." Revenge for what? For daring to defy Albanian delusions of grandeur? 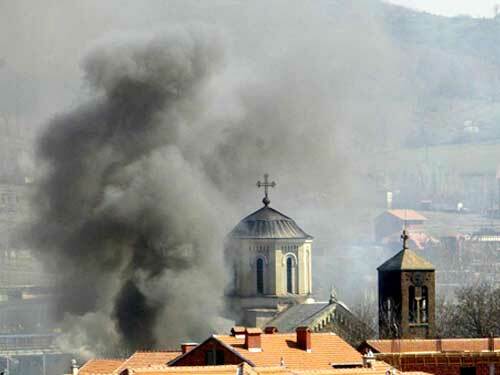 In 2004, the "Kosovarians" launched a veritable Kristallnacht, singling out churches for destruction and desecration (video). How did the Empire, which purports to fight for liberty, democracy, human rights and human dignity, react to this? By deciding to make "Kosovia" an independent, Albanian state - laws and treaties be damned. The grateful Kosovistanians then erected a golden idol of their "liberating" Emperor. After a Trojan Horse "revolution" took over Serbia in 2000, the succession of governments in Belgrade have only occasionally attempted to pursue Serbia's own interests. Even such efforts have been the proverbial day late and a dollar short. More often, though, the Belgrade government prostrated itself before the Empire, hoping to end the torment by fulfilling the never-ending series of demands. Not surprisingly, the more they submitted, the more they've been tormented. But since it was the people paying the price, not the politicians, the debasement has continued. The latest act of groveling was the decision to sign and implement the "Integrated Border Management" (IBM) agreement with the "Kosovians" and the EU. To their own public, the government lied that the "B" didn't really mean "border" but something else. Both the EU "law and order" mission that's overseeing "Kosovia" and the "Kosovarianians" themselves made sure to dispel that illusion this weekend, barring the president of Serbia from attending the Christmas ceremony at Grachanica monastery. The report I linked above comes from AP and AFP, via Deutsche Welle (Germany's official propaganda service). Not surprisingly, it adds insult to injury by treating seriously the "Kosovarian" claim the ban was "in response to Belgrade refusing entry to Kosovar officials." This is nonsense. Serbia has tolerated Albanian provocations for years, including the recent Flag Day festivities, and has even sent police to protect the monument to the terrorist KLA, though it was their duty to tear it down. No, the ban's purpose was to underscore the "independence" of "Kosovia" and the existence of the border that Belgrade has recognized as such. But don't expect the Western press to make note of this; they are just continuing to do what they've done for years: heaping abuse on the Serbs. A prime example of this is the final paragraph of the story (as it is improper to call it a news article): "Serbs celebrate Christmas on January 7 in accordance with the Serbian Orthodox Church which adheres to the Julian calendar instead of the modern, more widely-used Gregorian." The Serbian Orthodox Church celebrates Christmas on the same date as all other Christians: December 25. But the day of it falls on January 7 in the Gregorian calendar, due to the discrepancies between it and the Julian. And the reason the Serbian Orthodox Church (or the Russian, for that matter) does not use the Gregorian calendar has nothing to do with how "modern" or widely used it is, but the fact that it was established by a Roman Catholic Pope some 500 years after the schism between the Papacy and the Church. One would think the Germans of all people would have a clue about religious differences, considering their history. On the other hand, knowing the Germans' history with the Serbs, this really doesn't come as a surprise. Despite the ongoing efforts of the Germans, the Empire and the Albanians, however, there are still entirely too many Serbs keeping the faith with God, and refusing - unlike their tormentors - to bow to the one who promises "all the kingdoms of this world, and the glory of them." Celebrating the birth of their Savior, the Serbs can take comfort in the knowledge that their cause is one of hope, while that of their tormentors is truly forlorn.